ROXBURY, NJ – The state pulled a bait-and-switch when it comes to encouraging studies about consolidation of municipal services, says Craig Heard, the chairman of Roxbury-Mount Arlington Consolidation Study. 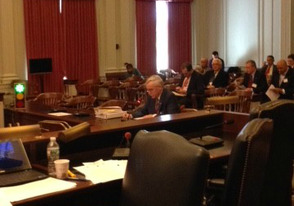 The Succasunna resident went to Trenton last week and testified before state Senate and Assembly budget committees, urging them to comply with provisions of the law designed to help commissions like the Roxbury-Mt. Arlington group do their work. Heard asked the legislators to force the state Department of Education (DOE) and the state Department of Community Affairs (DCA) to provide his commission objective studies about the pros and cons of consolidating Roxbury and Mount Arlington. These studies are required under the state Municipal Consolidation Act, he said. Heard also urged the state Assemblymen and Senators to follow another provision that requires the state to help the commissions pay for an outside consultant to review their preliminary findings. Heard said he’s been told that the DOE and DCA do not have the manpower to work on the studies. He also said he's learned the state spent the money it had earmarked to fund the commission’s consultant. The Roxbury-Mt. Arlington commission will need that money – probably about $40,000 - in nine or ten months, said Heard, noting the funds, and the DCA and DOE studies, are guaranteed under state law. If the commission subsequently decides a merger is warranted, the question would be placed on a ballot for the voters of each municipality to approve or reject. Heard, who is running for Congress in the GOP primary, testified before the Assembly Budget Committee and the Senate Budget & Appropriations Committee. Heard noted the Roxbury-Mt. Arlington effort is the first grassroots municipal consolidation initiative in the state. Heard said he suggested that the state consider amending the law to make it a “matching funds” arrangement in which municipalities, for which consolidation is being considered, have to come up with money toward the consultant’s fee before the state will match their funds. While making no commitments, some of the legislators said they liked that idea, said Heard.